Age Range: almost any, depending on who handles the fire. 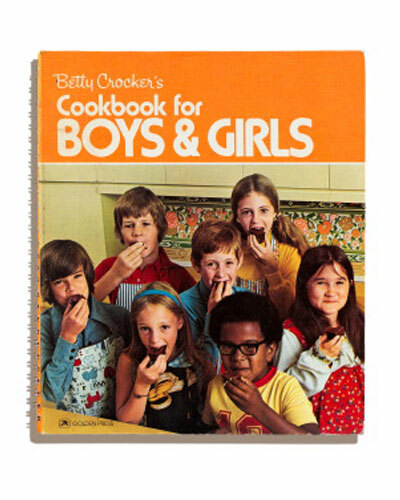 When I was eight years old, my mother gave me a copy of the Betty Crocker Cookbook for Boys and Girls. Not the first edition, people. This cookbook has been around since 1957. It was full of frightening recipes. Weird little polka dot pizzas made with frankfurters. A cake that looked like a hamburger on a sesame seed bun. Recipes calling for instant minced onion, pickles, Bisquick, and bottled dressing. I pored over the pictures in it, but I only ever made two things: a gingerbread ski chalet (of course!) 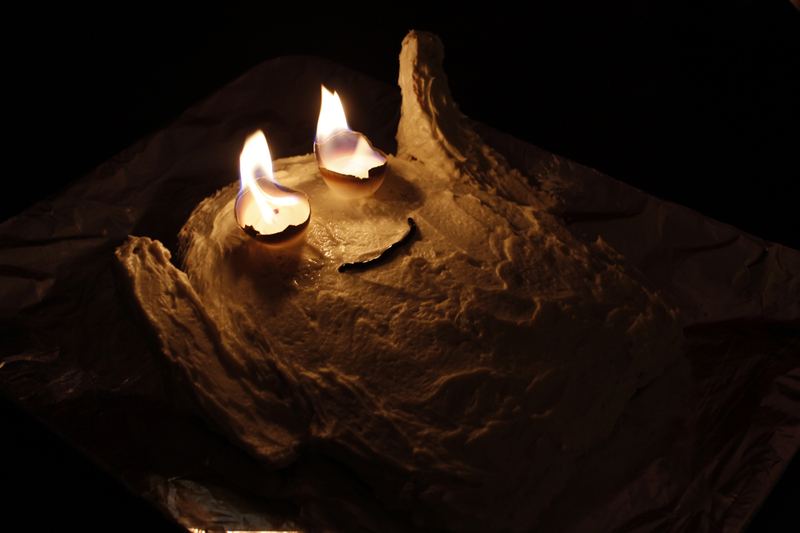 and the GHOST CAKE WITH FLAMING EYES. Now, you can make one, too. How is the following baking activity educational, you ask? I suppose you could bake the cake from scratch, maybe doubling the recipe or something. That’s math. But if you’re just dumping cake mix out of a box, you might feel a little short-changed. 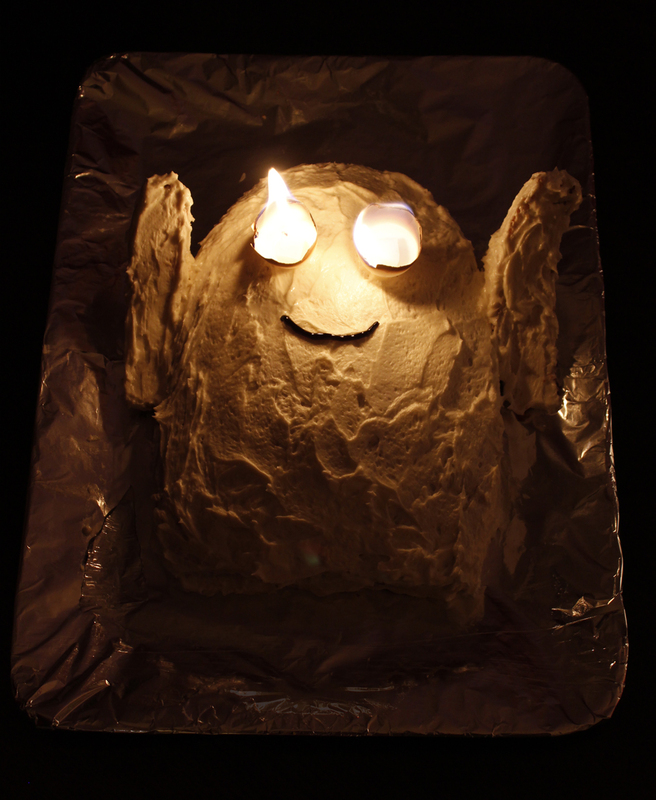 Consequently, I am providing links to some groovy Halloween science projects from Steve Spangler at the end of my post. I would include some of his pictures and more details, but Mr. Spangler has copyright warnings plastered all over his stuff. I suspect he is not particularly good at sharing. He is, however, a ceaseless source of fun science projects. *Something to make the ghost’s mouth: black icing? Licorice? Mini-chocolate chips? Don’t tell Betty, but my kids can’t stomach her can o’ frosting anymore. We had to make our own. Martha Stewart saved the day, though I tripled the amount of milk to get a better spreading consistency. Here’s the link. *A 9×13 cake. Since you have to get the cake out of the pan and monkey around with it, I recommend putting parchment paper in the pan before baking it. Can you tell my oven needs leveling? 1. 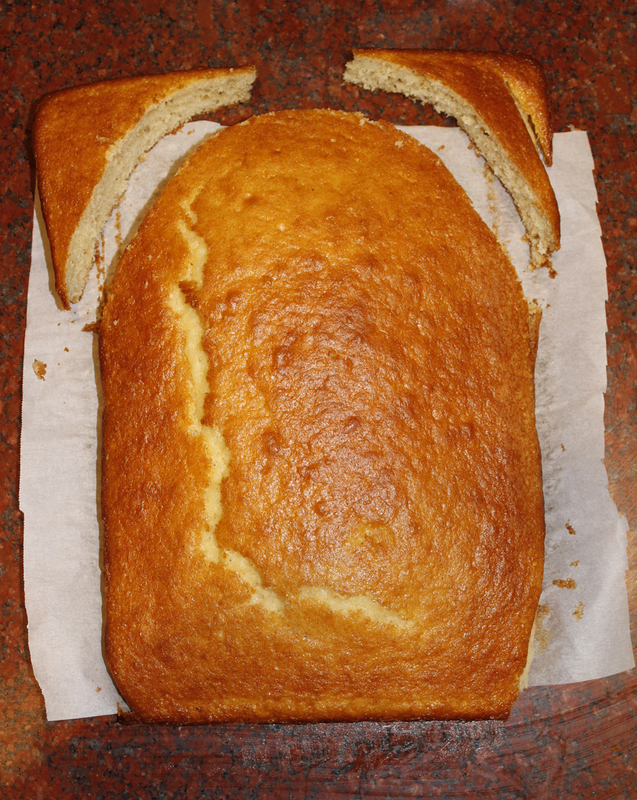 Find the center of one short end of the cake. Mark with a toothpick. 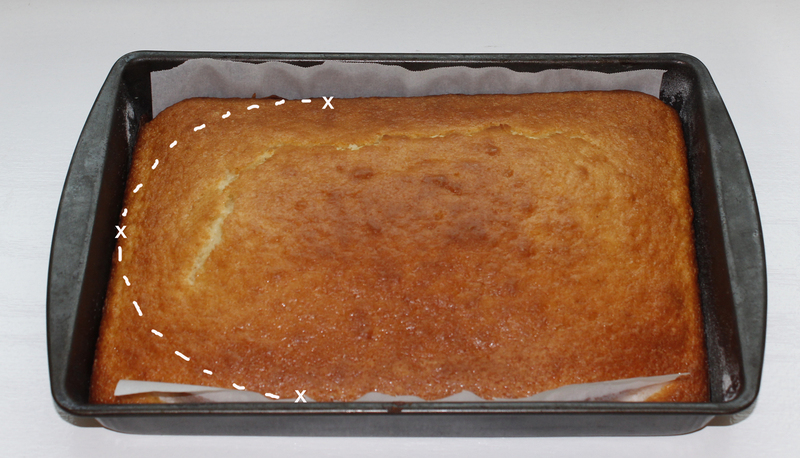 Measure about one-third of the way down one side of the cake and mark with a toothpick. Repeat on the other side. Here’s where to mark and cut. 2. Carefully cut an arc between the three points. 3. Remove the two smaller pieces and set aside for later. Place the large center piece on a platter. 4. 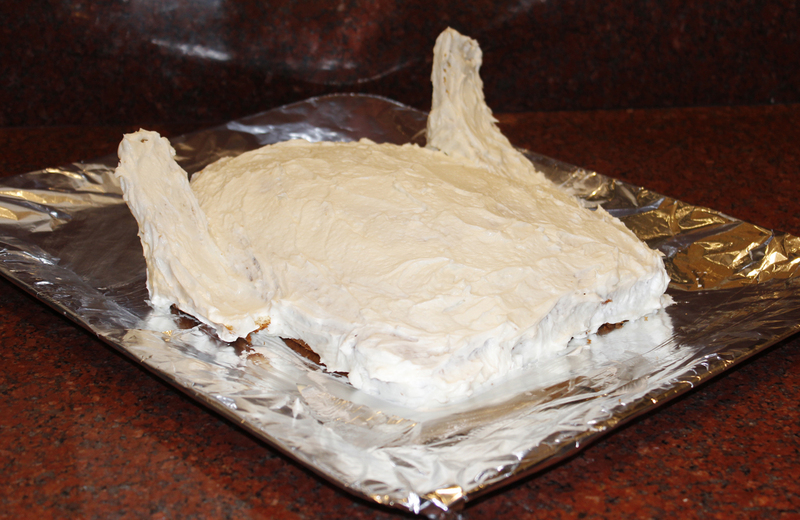 Frost the main cake, then use more frosting to attach the two smaller pieces–reaching up, in a haunting fashion. Frost those, too, though proceed cautiously. They are crumbly. 6. Put the eggshells on, placing a sugar cube in each one. 7. 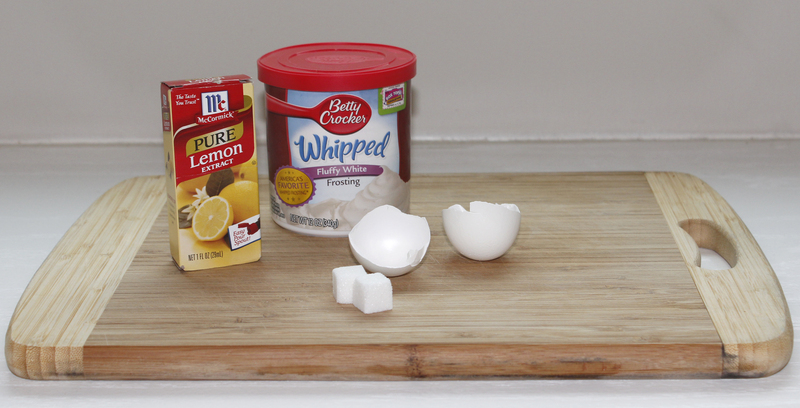 Pour a teaspoon of lemon extract into each eggshell, and light. *A note on the lemon extract. I tried to improvise. I thought, why should a person have to go out and purchase lemon extract for this project? Why not light other stuff? I searched the cabinets. I tried rum, tequila, vanilla extract, raspberry extract, and vodka. No can do. Some would burn a little, but nothing burns like lemon extract. Know why? It’s 87% alcohol. Maybe Everclear or Bacardi 151 would work. As promised. First, here’s the safe version of Steve Spangler’s Oozing Pumpkins, which uses yeast, dish soap, and hydrogen peroxide. If you’re looking for something a little more exciting, potassium iodide, dish soap, and hydrogen peroxide are spectacular. One last Spangler link: Glowing Pumpkins, done with zinc sulfide, black light, and spray adhesive. Super cool. You can buy luminous zinc sulfide powder on Amazon, or make your own. Personally, I think I’ll head out and get some more dry ice. I’ll toss it into our jack-o-lantern with a little water, because nothing’s spookier than sublimation. Incredible! I remember this cake and found this post on a search for how we made it (could not remember what went on the sugar cubes). I thought it was from a magazine but I had this cookbook, so obviously I was wrong. I remember those unappetizing frankfurter pizzas too. I think I stuck to desserts- I remember making cookies on popsicle sticks with chocolate discs inside, and I think there was a recipe for fortune cookies in it. Wow. 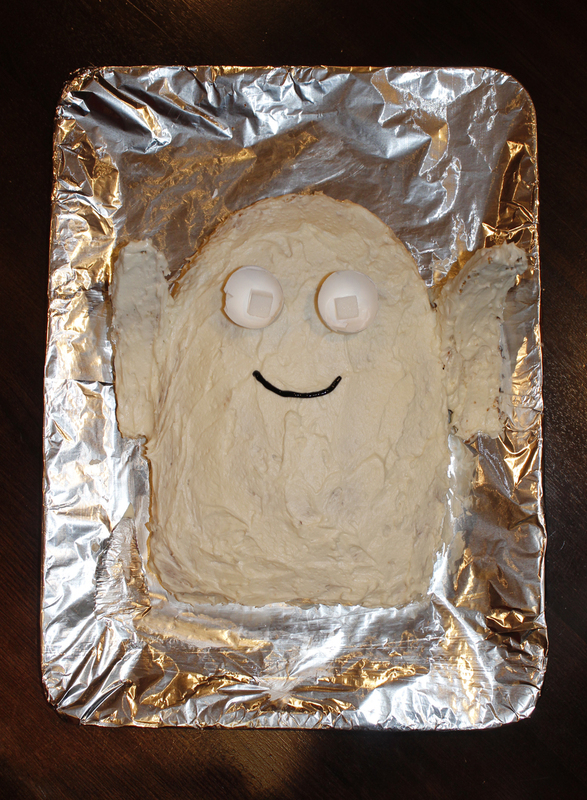 There were many, many terrifying recipes in this book, but the ghost cake made it all worthwhile.